The concept for this car was two fold. 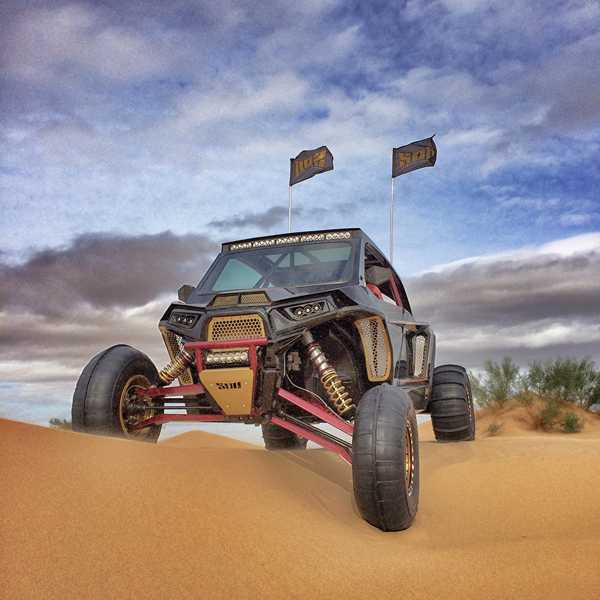 How could SDR Motorsports top the Destination Polaris build Betsy, then sprinkle in a few “money is no concern” additions to push this build over the top. Now Betsy was no slouch in her own right. 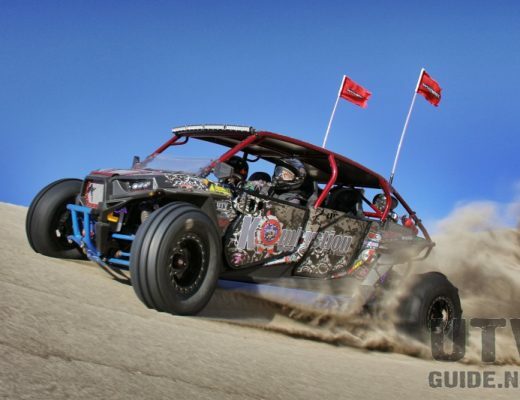 Turbocharged with long travel, custom cage and awesome graphics, she set the bar for top level custom builds last year. But almost a year later, SDR had bigger plans. The spark to light the fire for the “Christine” build would come from one of SDR’s customers from Doha, Qatar. 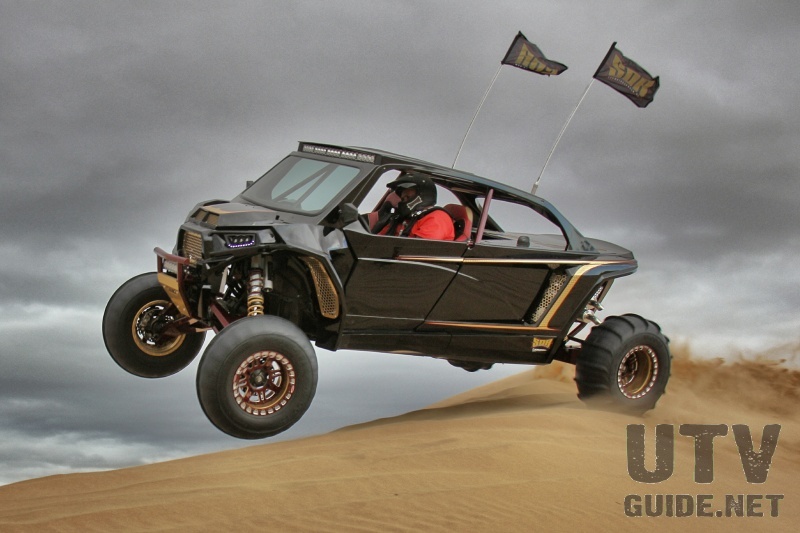 SDR had built several cars for for this customer, and he gave Tim at SDR full creative license to build the ultimate RZR. The only guidelines being to build it as if it was his own. 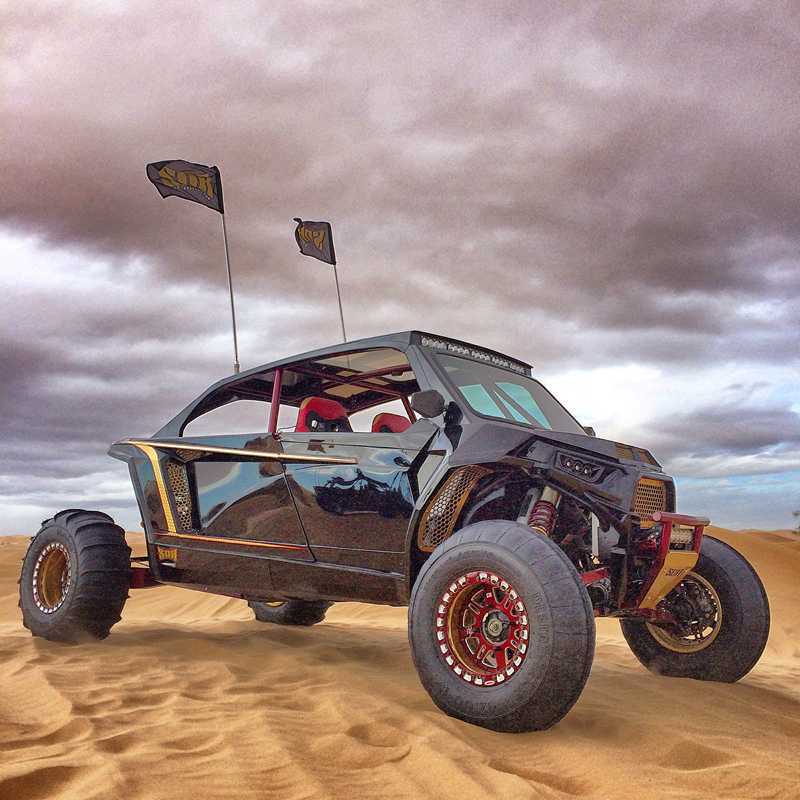 Tim knew that a full body car would set it apart so he got with Aaron and Pat from Next Level Aluminum Concepts and started laying out ideas for the project with the goal of debuting the car at the 2014 Sand Sports Super Show. Once they knew how the car would look, the SDR team got together to design and build the custom all DOM tig welded cage. Christine would be a would be a two-seater made from a 2014 Polaris RZR XP4 1000, so they removed the C pillar to stretch the lines of the roof and completely removed the stock bed and taillights. SDR’s lead fabricator Shawn then went to work and got her ready for the team at Next Level. 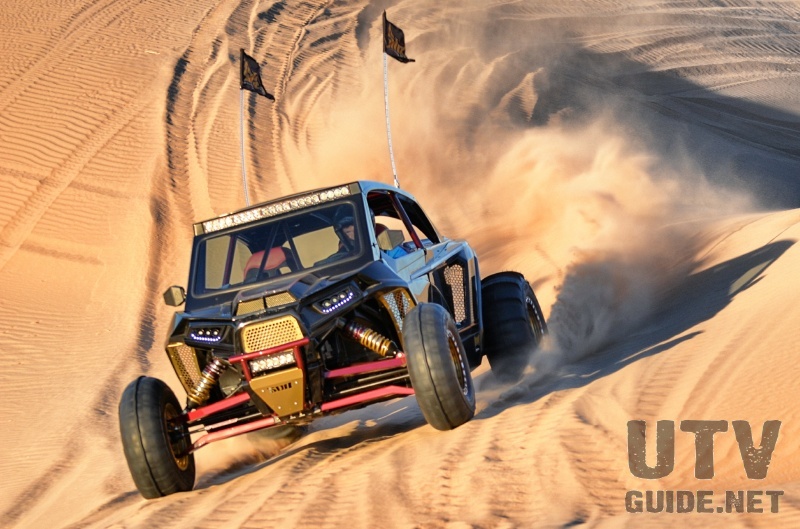 Aaron and Pat knocked it out of the park and seamlessly integrated the GlazzKraft full body kit, and built a custom Carbon Fiber Dash to hold all the switches and the new digital Polaris gauge kit. OMF Performance took care of the insane 15 inch beadlock wheels wrapped in STU sand tires custom grooved by the guys at Fullerton Sand Sports. Next up was suspension, and HCR Racing was the obvious choice for SDR. They do a ton of custom builds with HCR kits and it fit the build perfect. The HCR suspension pushes the width out 4-inches per side and lengthens the wheelbase by 3-inches. The extra width enables HCR to achieve a whopping 21-inches of wheel travel with King Internal Bypass shocks on each corner. A car like this needs some serious power so SDR turned to the guys at The Pro Shop for a full motor build. K&T Performance stepped up and supplied their turbo kit and pistons and the Pro Shop handled the install and tuning. At15lbs of boost she makes over 200HP to the wheels! SDR installed a rockin SSV Works stereo system that you have to hear to believe. The system features two ten-inch Subs, four 6.5-inch Speakers, custom SSV enclosures,Kicker speakers and two amps. A car like Christine needs to look as good at night as it does in the day so SDR Motorports used several sources to create an awesome pacakge. LED accent lighting from RadiantZ and Rigid Industries, replacement headlights from Heretic Studios and then topped it off with SDR’s exclusive Baja Designs ONX 37 inch ARC LED light bar. LED whip flags are from Pyramid Whips. Once the car was back from Next Level SDR had only a few weeks to get it buttoned up before the Sand Sports Super Show. 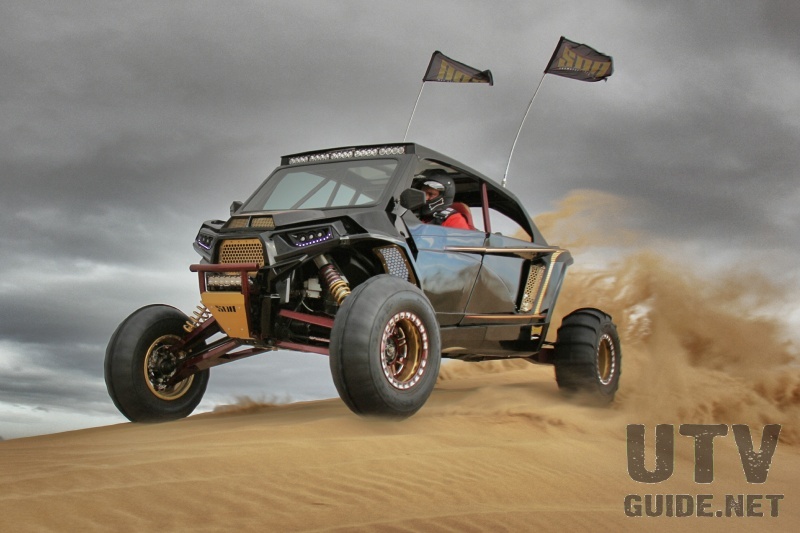 Haynie Design painted the GlazzKraft kit, Full Throttle Powdercoating took care of the gold and maroon candy coating and then Jim from Smith Designs added a 22K gold flake that is machine turned as an accent. Once the car was back from paint, it was up to the SDR team to get it done in time for the show. To build a car like this takes an amazing number of people to make it happen. The crew at SDR Motorsports is the absolute best at what they do. From the production team to the install team everyone in the building played a big part in this build and the results speak volumes. 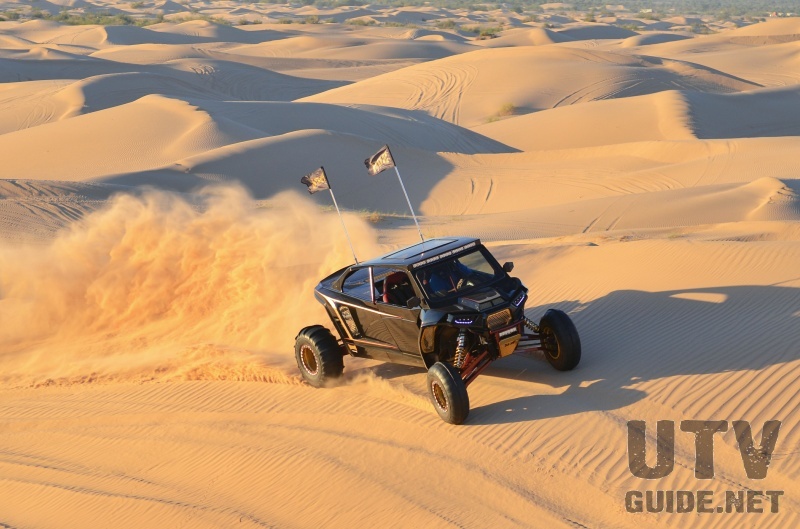 We hooked up with SDR Motorsports at Camp RZR where they brought Christine for final field testing before she gets on a place for Qatar. While we knew that she looked incredible sitting still, we were anxious to see how Christine handled herself in the dunes. 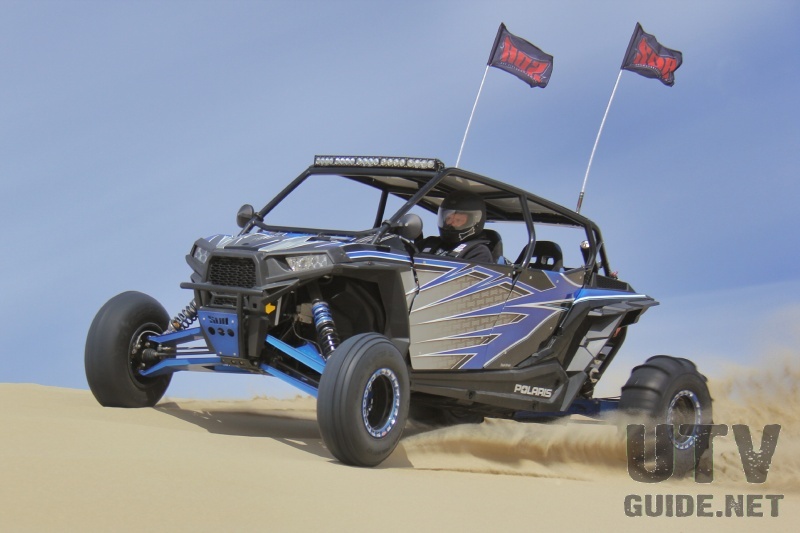 Tim was understandably a little more timid behind the wheel, but who wouldn’t be driving a $80,000+ RZR that isn’t yours!